Sold by Fotopro Au and Fulfilled by Amazon. Gift-wrap available. 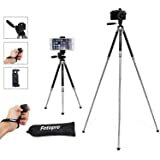 【DURABLE AND RESISTANT】: Fotopro Flexible tripod made with high-density rubber-coated Robust legs which makes it more sturdy and durable , It can be bent arbitrarily and attached anywhere. (sloping or slick surfaces). you can wrap it anywhere you want and no worries being broken for bending many times. 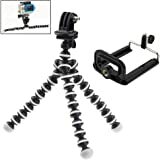 【WATERPROOF & FLEXIBLE Tripod Legs】: The strong flexible legs can easily wrap around tree branch, fence, bench, bicycle, just shake the tripod as you like. allowing you to capture different angles on your trip. 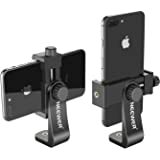 【EASY TO SET UP】: The adjustable and quick release phone mount grasps to your phone or camera sturdy and won't fall out. Sold by Fotopro Au and ships from Amazon Fulfillment. Never use a tripod before. At first glance, I was very impressive for the size. It can be easily put into a backpack. However, the height can be adjusted via the adjustable leg sections. It gives a good compromise between maximum height and minimum folded height. This travel-friendly design makes it more convenient to carry. It’s a locking clamp on each section which makes it easier and quicker to operate when it’s used in uneven surface. 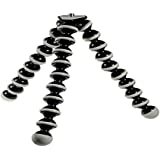 The tripod is made by aluminium, light but feels premium. Honestly, I was confused how to put the camera/phone on the tripod as a beginner usually did. But the manual helped me to understand it quickly. There’re some accessories in the package, mount holders, Bluetooth remote control, carry bag etc. All in all, I’m really happy with this tripod. It provides all functions which I expected. I am a green hand on shooting photos and video, I would like to share my feelings about this tripped with you, hope this can help you to make a better choice. This is a decent entry-level tripod, with a number of adjustment options. It is not heavy duty, and not aimed at professional use. There are plenty of adjustment options- each leg has 3 separate, locking adjustment sections which increase the height of the tripod. These are easy to snap on and off. And the center column helps to adjust the height too. Together, these increase the height to the maximum 48" stated. You can get height you need from 15" to 48". The top if the tripod features a spirit level to ensure you have set it on the level ground/adjusted the legs evenly- a very nice touch at the price point. 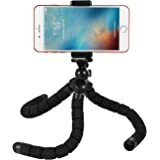 It also provides a standard screw mount for your camera or phone holder(This tripod comes with the phone holder and GoPro mount adapter,as well as a bluetooth remote). Generally, this is a fantastic entry level tripped for any of you, like me, looking to start experimenting with video or photo. I hope this has helped- please leave a vote if so, or feel free to ask me any further questions and I will try my best to help you out! Thanks for reading. 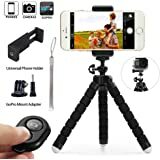 If I didn’t know the price of this tripod, I would have assumed it was over $200, this tripod really is as good if not better than some of the top brands such as manfrotto, the tripod comes with some hand accessories such as a smartphone holder a remote shutter button (so you don’t shake your phone while trying to take a picture) as well as a GoPro mount which doesn’t come included with the more expensive brands. 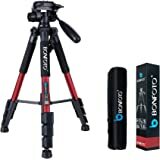 The tripod is very portable at only 0.57 kg and folds down to an impressive 38 cm, the maximum is also very good at 122.5 cm, it even remains stable with up to 2kg, I have tested this myself and it can hold a 6dii with a 24-105 l lens with no issues at all. Overall this product exceeded my expectations greatly and would recommend to everyone. 5.0 out of 5 starsgood for starter! I bought this because of my class assignment and for further investment since I'm planning to seriously pursue photography. It is light and easy to move. I already used it for both DSLR camera and smartphone and it works perfectly well! I thought it's going to have a tough time with DSLR as the material is light and seems fragile, but I guess as long as I don't put to much stress on it then it's okay. 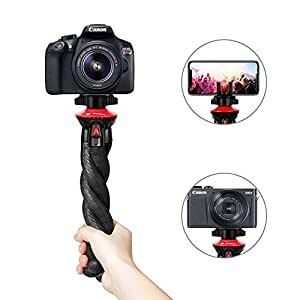 it's as good as a beginner can get without creating a hole in your pocket, but still having a good quality tripod for long-use. 5.0 out of 5 starsStiff yet flexible legs make this very versatile and sturdy. I sprayed mine black to give it a stealth look and it looks awesome. 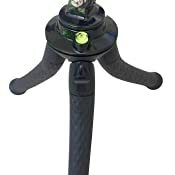 The 3 rubber coated legs make a comfy thick grip when folded together. Super grippy feet and the level bubble is perfect and super easy. Great purchase for a fussy GoPro user. The camera tripod stand is stable and adjustable. It is light & easy to carry. It is a good gift for someone who likes to record the performance. Highly recommended. Excellent stand - I love it! Only issue is the Bluetooth remote seems to have em effect on my iPhone keyboard functions. When connected I have to restart my phone to use the keyboard to send a text etc. very strange. Other than that it works perfect and I’m really glad I bought it. Better than I expected. The product quality is solid and it comes with different adapters to mount different device. I use it as a portable light stand and it works perfectly. 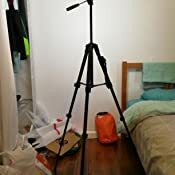 I would recommend anyone that is looking for something lightweight and solid build tripod.